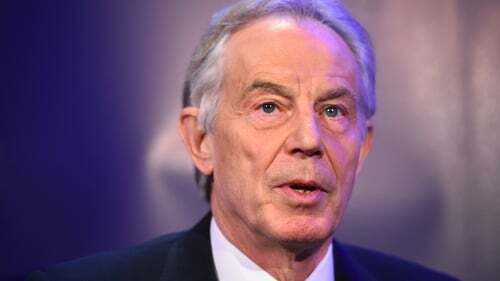 Former British prime minister Tony Blair has reiterated his warnings on the consequences of a no-deal Brexit, saying it could be "devastating" for the Northern Ireland peace process. Mr Blair said no deal will inevitably lead to a "really hard border" on the island of Ireland and cause a huge split within the UK. Mr Blair - a vocal advocate of the UK remaining in the EU - said he believed a second Brexit referendum might happen "when people see what the true Brexit alternatives are". The former Labour leader told Sky News: "No one could responsibly propose (a no-deal Brexit). It would be economically very, very dangerous for Britain, and for the peace process in Ireland it would potentially be devastating. "You would have a hard border, very hard border. A no-deal Brexit means a really hard border between north and south in Ireland, it's contrary to the Good Friday Agreement and it will cause an enormous fissure within the United Kingdom." Mr Blair, who has argued strongly for a second EU referendum, added: "I've never thought that you would get to another referendum going directly to it - you'll get to it when people see what the true Brexit alternatives are. And the truth is there are two. He said: "The argument just goes on, and by then you'll have left, you'll have paid your money up front, you'll have given up your negotiating leverage.